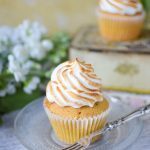 These lemon meringue cupcakes are light and fluffy lemon sponges filled with a tart and creamy lemon curd and finished off with a perfect swirl of toasted meringue. 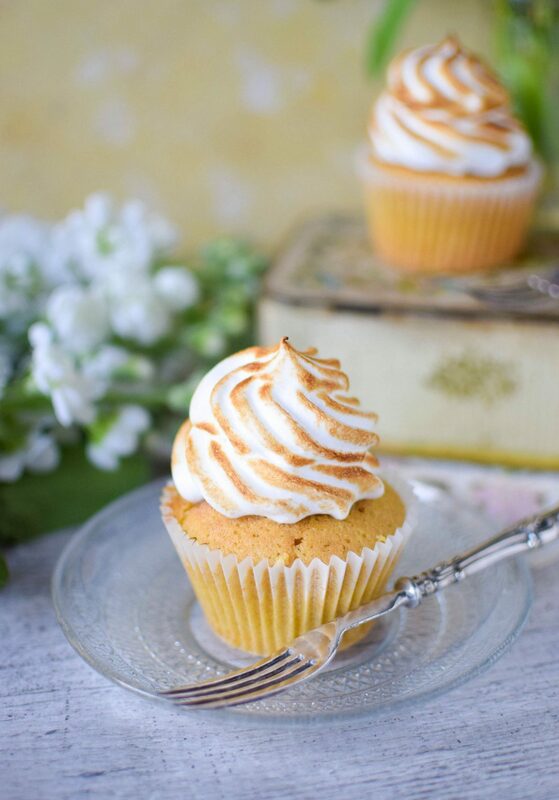 Like lemon meringue pie in a cupcake, just perfect. I’ve written about my love of Lemon Meringue Pie on this blog many times before, it holds the top spot on my favourite dessert list along with Key Lime Pie. I love them both too much to force them to fight it out for the gold medal, I’m happy letting them share. As much as I love a lemon meringue pie, and I love to bake them, having one in the house is dangerous. I tend to eat the whole damn thing before anyone else even gets a look in. Don’t blame me, they’re just so damn delicious. So, I decided to take the flavour I love so much and transform it into something a little more manageable, hence these lemon meringue cupcakes were born. You might think, ‘but Katie, what’s stopping you from demolishing a full batch of cupcakes since you clearly have no self control?’ Easy, I can send cupcakes to work with Kris, or up to my Stepdads office (he handily works a five minute walk from my house). Taking a pie to work is a bit of a palava, you need a big knife, plates and forks meaning they often stay with, and get eaten by me. Bad! Cupcakes however can be easily transported and eaten without fuss therefore they can be removed from temptation. Good! Plus, brownie points! These cupcakes are so so good, the sponge is lightly flavoured with lemon zest then filled with the star of the show, lemon curd. I like to make my own but I included store bought in this recipe to keep it simple for you guys. Let me know if you’d like to see a recipe for my homemade lemon curd and I’ll happily whip up a post. Homemade truly is better and once you’ve tried it for yourself, you’ll never go back. If you don’t have a cooks blowtorch I highly recommend getting one. They’re super inexpensive and so fun to use (if you’re careful, no burnt hands here). I used mine all the time for cocktails and baking, they’re much more reliable than using the grill. This is the one I use , I’ve had it years and it’s still going strong! Not bad for a tenner. The the bowl of an electric mixer whip the butter lemon zest and sugar together till light and creamy, around 3-5 minutes. Add the eggs one at a time mixing between each addition. Add half the flour and mix, add the milk followed by the rest of the flour and the baking powder. Mix until just combined. Once cooled hollow out the center of each cupcake using an apple corer or a sharp knife. Fill each hollow with lemon curd and set aside while you make the meringue. To make the meringue: using a very clean work bowl, whip the egg whites and cream of tartar until soft peaks form. Add the salt. Gradually add the sugar spoon full at a time, increasing the whipping speed and continuing to whip until the mixture is light and fluffy, and stiff peaks form. 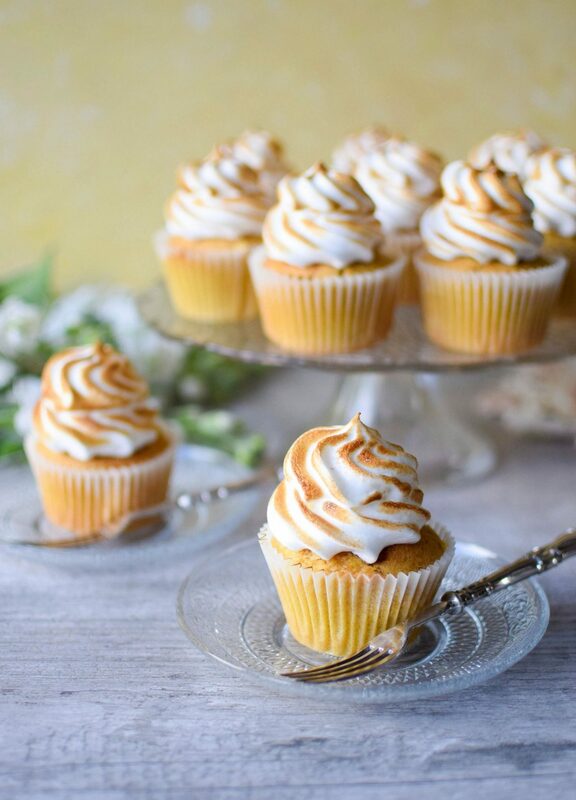 Pipe a swirl of meringue onto each cupcake, then toast the meringue with a cook’s torch until golden brown. These cupcakes are best eaten on the day they are made. If you don’t have a cooks blowtorch you can toast the meringue under the grill. Just make sure you keep your eyes on them as they burn super quick. You’ll need no more than 30 seconds under a heated grill. These look incredible! I pinned it! Next time I decide to bake something, I’m trying these! How perfect are these cupcakes?! 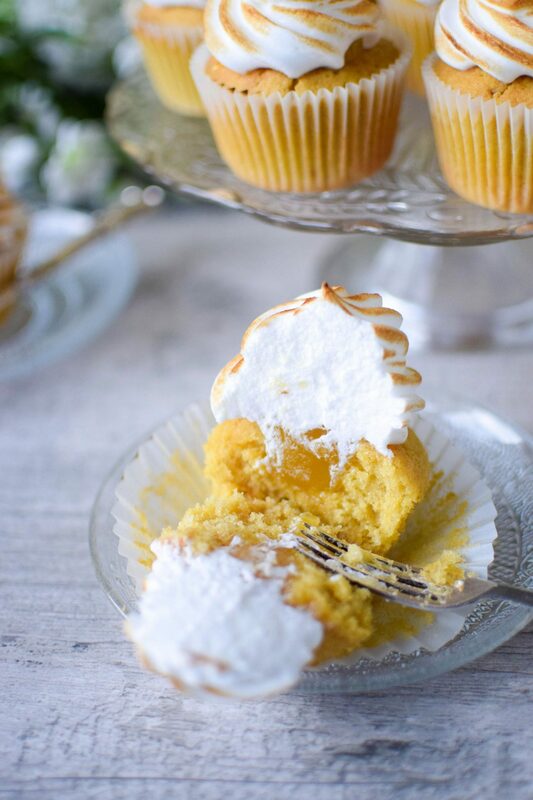 I am such a lemon meringue fan and so I know I would love this recipe! Pinning for later, thanks! Mmm these have got my mouth watering. 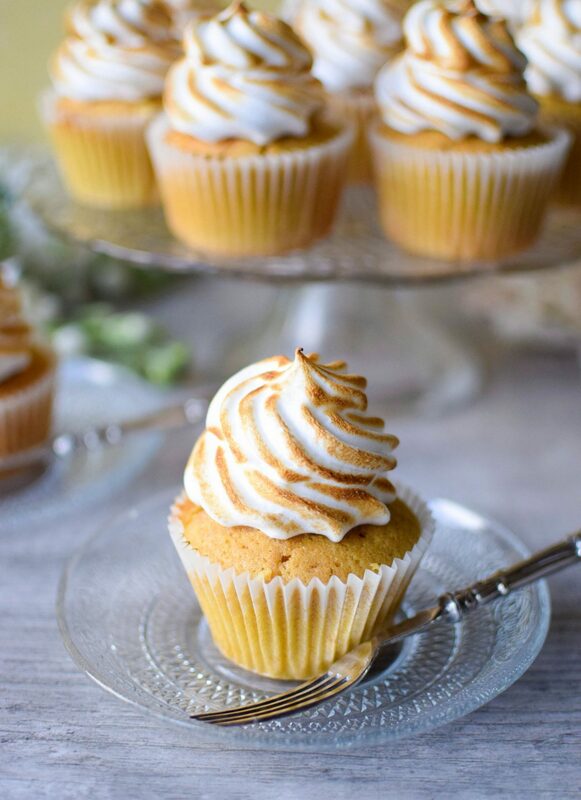 Two of my favourite things, lemon meringue and cupcakes, combined into one. I’d be tempted to eat all of them in one go though, oops! Oh yum! Lemon Meringue is my absolute favourite desert! I’ll definitely be trying these. I absolutely love citrus flavoured desserts, so I love the idea of this cupcake! It sounds delicious! I don’t really think you can beat lemon cakes or lemon anything in the summer!